The thought of paying upwards of $10 to $25 for a Lobster Roll Sandwich is galling to me. That much money and no sides? Fuddegabdit. It's my inner cheapskate that stops me from indulging in this summer favorite sandwich. That and knowing that the sandwich is so high in fat. I figure for 10 to 20 bucks, I could have hamburgers and fries or a steak and baked potato along with a salad and vegetable. Lobsters are not that expensive and that I can make almost anything lower-fat and healthier, I decided to make my own lobster rolls for dinner. It was also inspiration from my friend, Barbara Hammond (ZeroToSixtyAndBeyond.com), as she made an awesome lobster salad for us this summer at the Blogstress Summer Get-Together. Her salad looked like a bowl of confetti - colorful and festive. 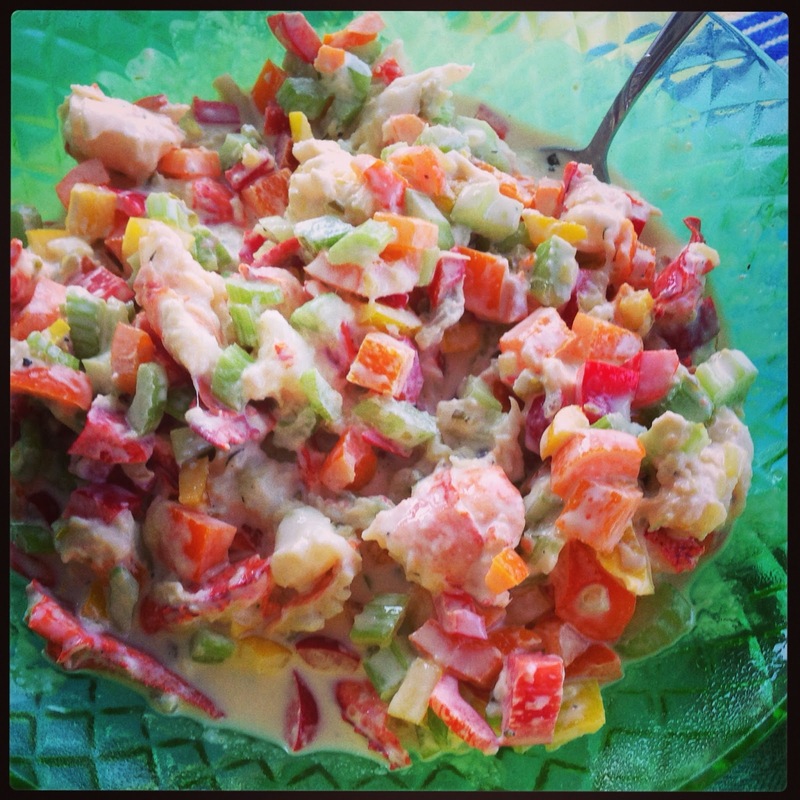 I haven't been able to satisfy my craving for lobster salad since July! Wegmans, one of the best things about living in South Jersey, had lobsters on sale for $9.99 per pound. It's not as good of a buy as it was down the shore at ShopRite where they were $5.99 a pound, then again, I don't want to spend over an hour and a quarter tank of gas just so I can "save" $4! 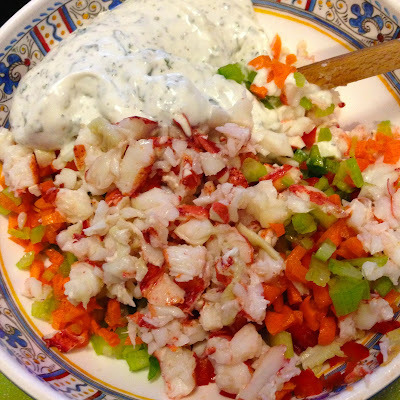 A freshly steamed lobster, some bell peppers, celery, carrots, Greek Yogurt, Rice Vinegar, seasonings and a dash of low-fat mayonnaise and my summer food craving is sated. If you are able to find "New England-style"Rolls - squared hot dog buns that are split open at the top, buy them! They add to the "authenticity" of the sandwich. 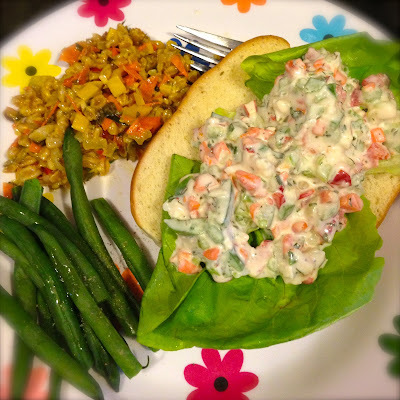 If you are skipping the bread and carbs, then serve the salad in Bibb or Boston Lettuce Leaves. We found the rolls and splurged on the squishy white-bread goodness. The cost per serving for us to have these at home came down to about $3.50 per serving - and I know the fat and sodium content was definitely better for me. Plus, I could have all the sides of healthy salads and vegetables that I wanted and not feel like I broke my zipper and the bank at the same time! 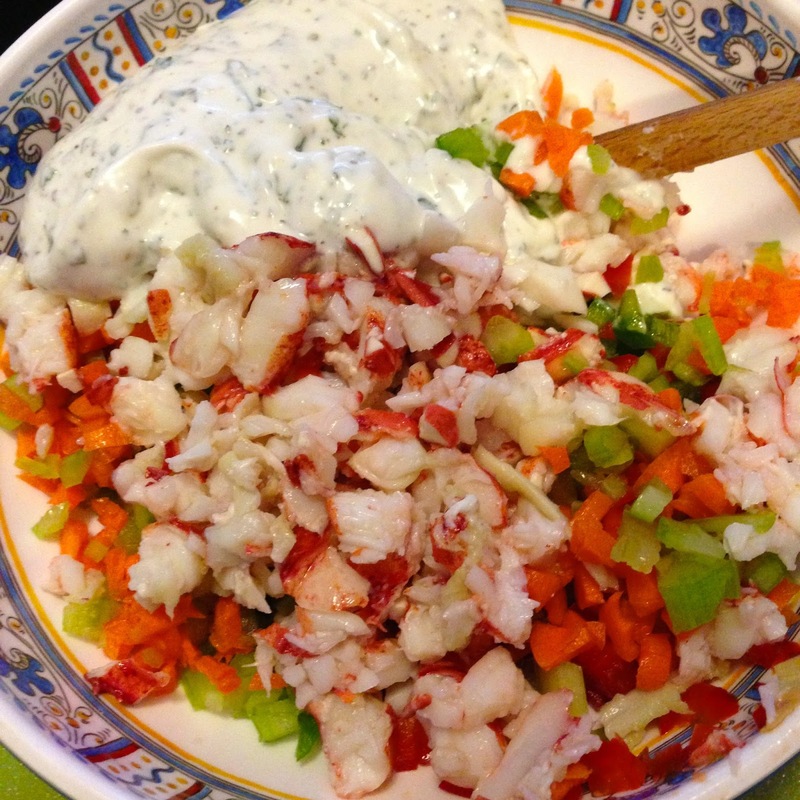 Remove lobster meat from the shell and roughly chop into small pieces. Add to a mixing bowl and set aside. Dice the red and green bell peppers, celery and dice or shred the carrots. Add all the vegetables to the lobster. In a small bowl, whisk together the non-fat Greek yogurt, vinegar, mayonnaise, and dried herbs. Season to taste with freshly ground black pepper. 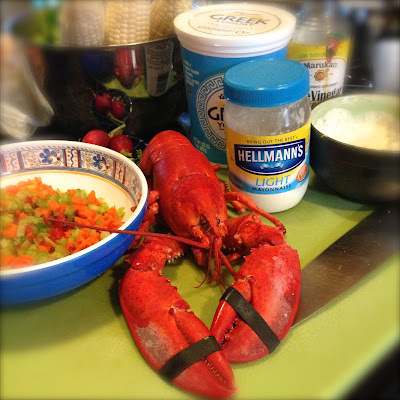 Hold off on seasoning with salt until you dress the lobster. Whisk thoroughly to combine, then pour the dressing over the lobster and vegetables. Fold to combine. Refrigerate, cover and chill the salad until ready to serve. When ready to server, toast the buns or have the lettuce leaves ready to fill with the lobster salad. Serves 2 to 4; 2 generous servings or 4 moderately filled sandwiches. Will hold for up to 2 days. Best used within one day. Stir before serving. To make in larger amounts, increase the proportions - the dressing base is enough to serve up to 6. Add in more lobster meat and vegetables as needed. A few more handfuls of diced veggies will go a long way! Glad I inspired you! I made it again this past week. I know my days are numbered, so have to enjoy before the season ends! I would think that the season for Lobster goes a lot further - as they are a cold water species, and should be even better as we get into fall! Thanks again for the inspiration! Hey Denine! This looks great! I did splurge for the lobstah roll when we were up in Maine...I just HAD to, but that was definitely a sometimes treat. I'd love to try this out. Can you walk me through the steaming the lobster part and then how to obtain the luscious lobster meat, when you have a chance. Miss you guys! Thanks Lynette! 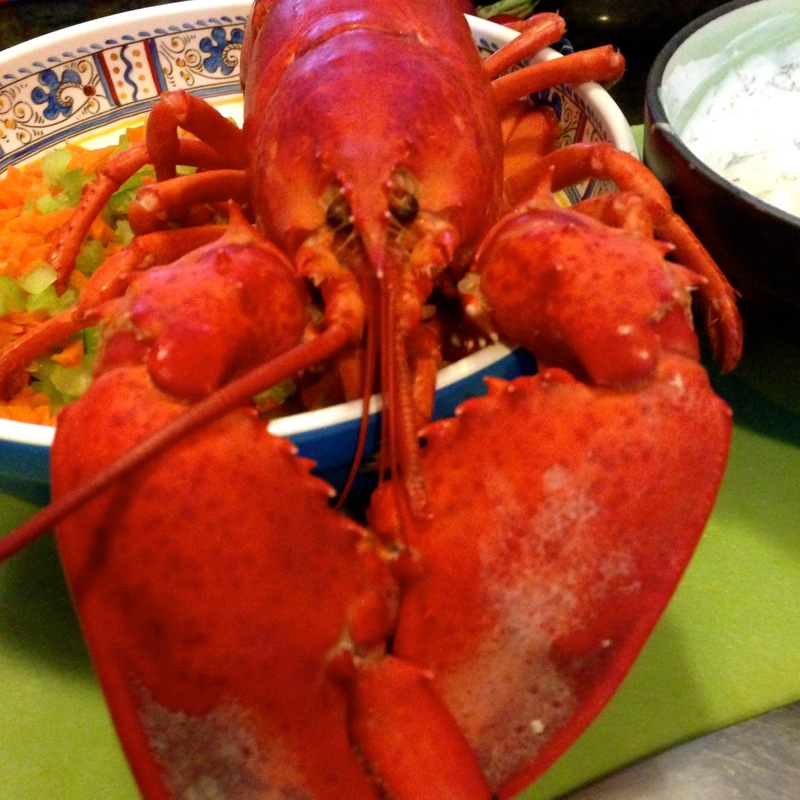 I actually didn't steam the lobster myself - the fish counter can do it for you, usually for free. Or you can buy them pre-steamed and ready to go in the fish dept. As far as cracking into the shell - I yanked the tail off, over the sink (they'll be water in it from the steaming) and then discarded the tomale (that's a treat to some but not to me!) and then ripped off the claws - and either crack with a knife or nut crackers, carefully. If you use a knife into the shell, it should enable you to make an incission in the shell to then crack it open to pull out the claw meat and tail meat. It may even be possible to have the fish monger do it all for you! Great recipe...thanks to you and the person that inspired it. I might have to try this with the lettuce wraps.